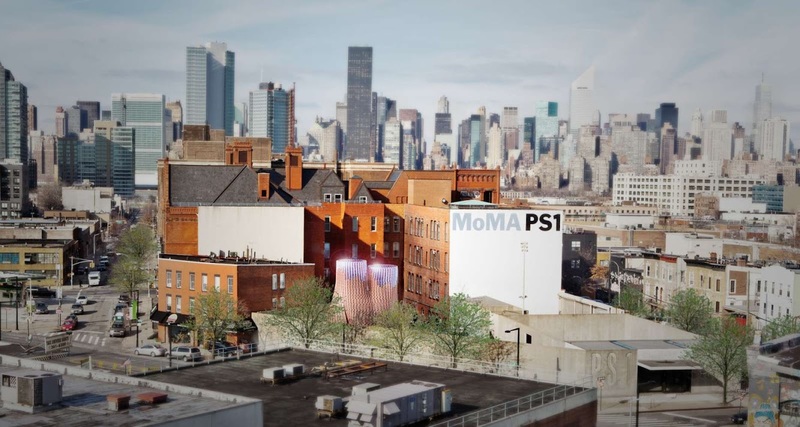 The Museum of Modern Art and MoMa Ps1 announce The Living (David Benjamin) as the winner the 15th edition of Young Architects Program (YAP) in New York. 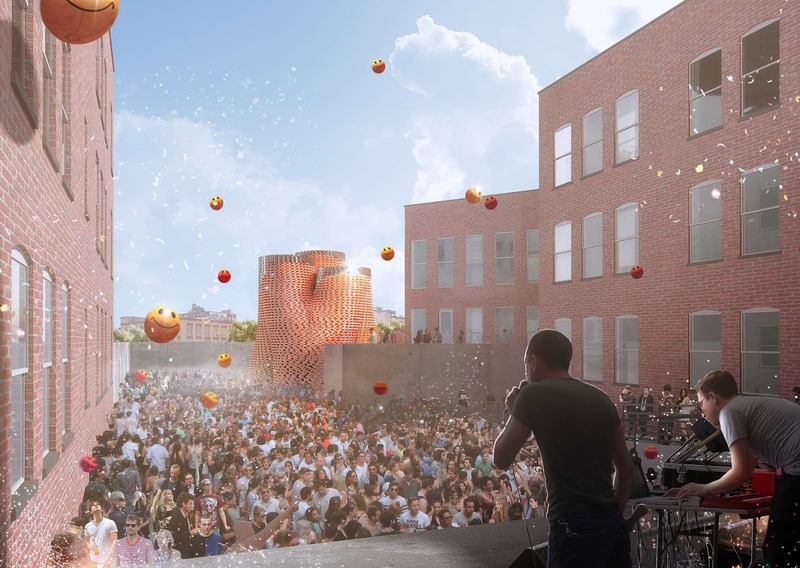 The winning project, Hy-Fi, opens at MoMa Ps1 in Long Island City in late June. Using biological technologies combined with cutting-edge computation and engineering to create new building materials, The Living will use a new method of bio-design, resulting in a structure that is 100% organic material. The structure temporarily diverts the natural carbon cycle to produce a building that grows out of nothing but earth and returns to nothing but earth—with almost no waste, no energy needs, and no carbon emissions. This approach offers a new vision for society’s approach to physical objects and the built environment. It also offers a new definition of local materials, and a direct relationship to New York state agriculture and innovation culture, New York City artists and non-profits, and Queens community gardens. 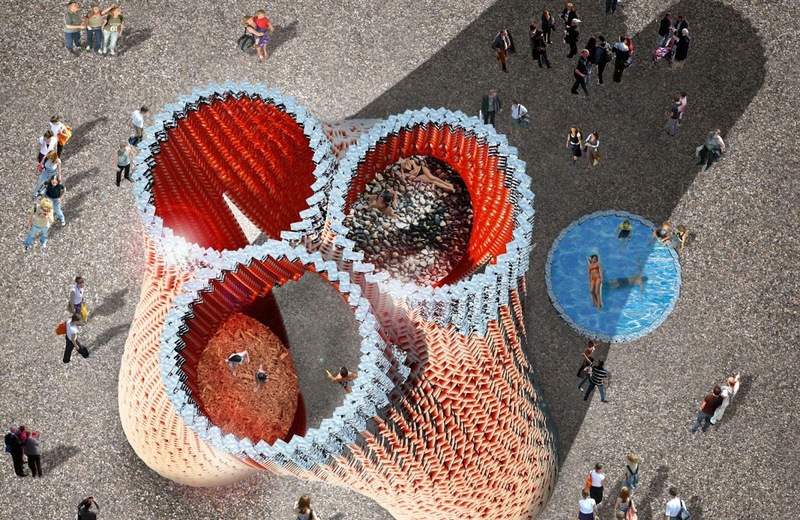 Hy-Fi is a circular tower of organic and reflective bricks, which were designed to combine the unique properties of two new materials. The organic bricks are produced through an innovative combination of corn stalks (that otherwise have no value) and specially-developed living root structures, a process that was invented by Ecovative, an innovative company that The Living is collaborating with. the reflective bricks are produced through the custom-forming of a new daylighting mirror film invented by 3M. the reflective bricks are used as growing trays for the organic bricks, and then they are incorporated into the final construction before being shipped back to 3M for use in further research. The organic bricks are arranged at the bottom of the structure and the reflective bricks are arranged at the top to bounce light down on the towers and the ground. the structure inverts the logic of load-bearing brick construction and creates a gravity-defying effect—instead of being thick and dense at the bottom, it is thin and porous at the bottom. 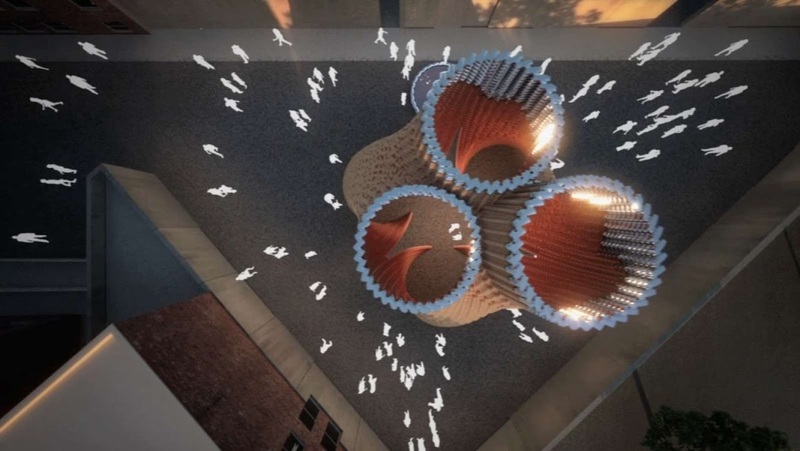 the structure is calibrated to create a cool micro-climate in the summer by drawing in cool air at the bottom and pushing out hot air at the top. The structure creates mesmerizing light effects on its interior walls through reflected caustic patterns. 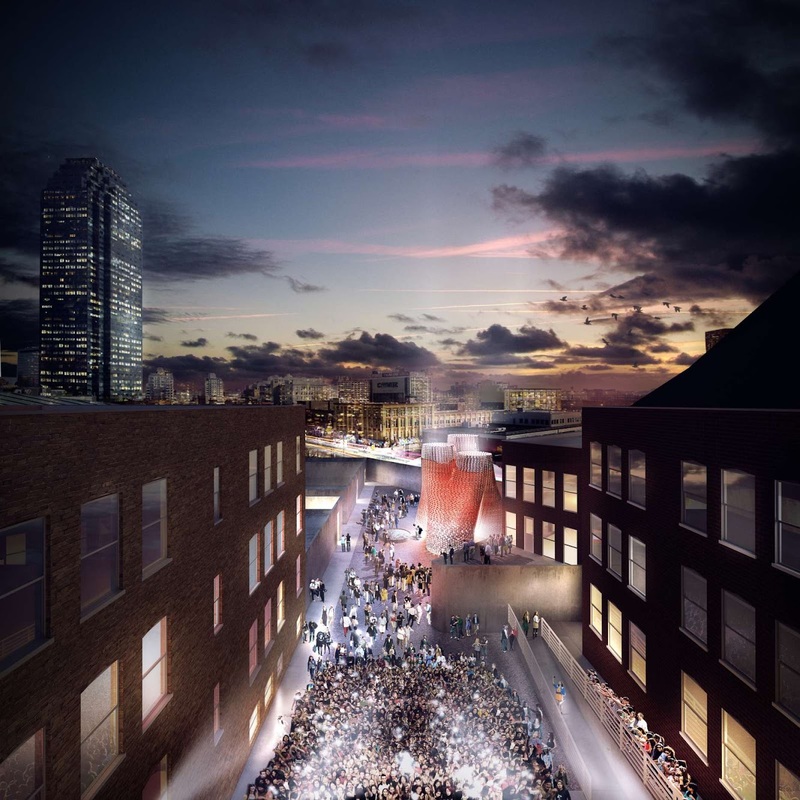 Hy-Fi offers a familiar—yet completely new—structure in the context of the glass towers of the New York City skyline and the brick construction of the MoMa Ps1 building. 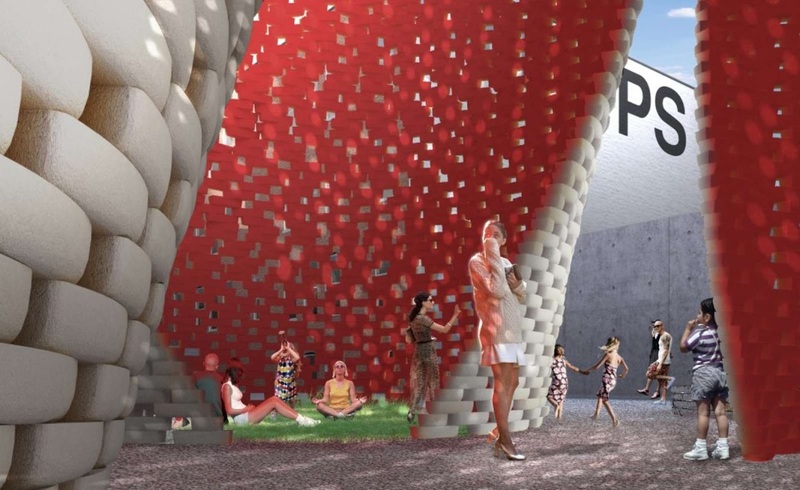 And overall, the structure offers shade, color, light, views, and a future-oriented experience that is designed to be refreshing, thought-provoking, and full of wonder and optimism.